The photos will be winging their way to you all soon (as soon as you let me know your postal addresses – you should all have received an email asking for this too!). 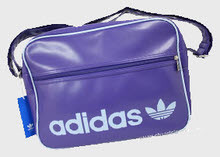 Footie Team Bags – Did You Have One? Having written about school bags with football team names printed on them earlier this week, I think the obvious survey for this week is to see how many of you had a school bag with a footie team emblazoned on the side. Just vote Yes or No below, and if you want to admit to which team you supported back then, why not add a comment. As I mentioned in the article, I had a West Ham bag, although it was more because I liked the colour of it than because that was my team of choice. Did you have a football team bag at school? Unlike many of the sweets I’ve covered in these very web pages, the Curly Wurly is still very much alive and well, which is nice too know. I’ll get the complaint out of the way first then. Are these, like many sweets today seem to be, smaller than they used to be? I’m pretty sure they are, but of course maybe it’s just down to the fact that when you are a small child they seem much bigger, but the memory of them never quite leaves you. Creme Eggs are another good example of this phenomenon – I’m sure you used to be able to sit them in an egg cup like a proper egg, but now they roll about in the bottom. 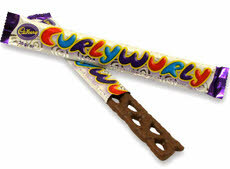 Gripe out of the way then, let us now celebrate the wondrous idea that is the Curly Wurly. Simple ingredients (just chocolate and caramel) put together in that weird ladder shape with the wobbly rungs, the design was actually quite clever in that it made eating the bar much easier for little ‘uns with smaller mouths. Any more caramel and it would have required far too much biting and chewing to eat. But by far the best feature has to be the name. Who could possibly come up with a better name than Curly Wurly? Not only does it fit the choccy bar perfectly it’s also the kind of name that oozes appeal for kids. Somehow you always felt a little mischievous asking for one (or maybe that was just me?). These days most kids probably have a school bag decorated with a picture of whatever the current most popular TV show is (so for the boys it’s probably Ben 10 at the moment, and for the girls maybe still High School Musical, or perhaps Hannah Montana) and that bag is probably a rucksack. Back when I were a lad though, it would have been more likely to be a holdall style bag (or possibly a leather (or leather effect) satchel when you first started school – I bet they’re hard to track down now). For the girls this would probably have been pink or another girly colour, possibly with a picture of a horse or pony, whilst for the boys it would have undoubtedly been a football team bag, not dissimilar in style to that shown above, which is actually a currently available retro styled bag. Now, I was never really into football. Sure, I had the odd kick about but since my Dad wasn’t a footie fan he never passed it on to me like many father’s do to their sons. When I first started going to school though, I suddenly discovered that most boys were big football fans, so in an effort to try and fit in I thought I had better start to show an interest too. Most of the boys at my primary school would have had a holdall with their favourite football teams name on (and perhaps a picture of a footballer, a football or the clubs emblem). Most were also colour coded to the chosen team’s football strip as well. 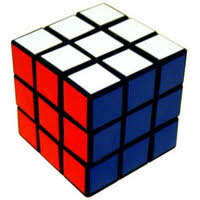 When it comes to iconic items from the Eighties they don’t get more iconic than the humble Rubik’s Cube. It may have caused many a gnashed tooth and uttered profanity, but there’s no denying that when someone wants a picture to illustrate the decade of the 1980s, they go straight for the cube. There are countless compilation albums and books featuring the cube on the cover, and a fair few websites too (hey, I’m as guilty as the rest of them!). Whilst most of us would just fiddle and twiddle with the thing for hours, perhaps completing one side and then giving up, boffins around the world have been trying to work out what the maximum number of moves required to solve the cube is. This magic number, nick named a God Number, is a surprisingly low twenty – yep, a maximum of 20 moves is all that is required to solve any combination of the cube! So how did they get to this number? Well, firstly the scientists took every single possible mixed up cube combination (a mere 43,252,003,274,489,856,000 possibilities!) and dissected this up into groups of similar types which would all be solved in the same way. These groups were further wittled down by taking symmetry into account, which left just 2.21 billion groups to solve! A computer program was then devised to solve each combination in the most optimum manner. On a reasonably powered desktop PC this took around 20-30 seconds to solve a single combination. Not bad, but 2.21 billion groups would still take around 35 years of non-stop processing to complete! 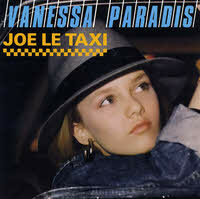 Today’s post is about one of those things I distinctly remember liking as a child, yet when I try and remember the details everything is a bit hazy. I’ll start by telling you what I remember. I would have been around ten at the time, still at primary school, and at the end of the day the teacher still used to read the class a story, though being as we were that bit older it was a longer story split over several days or even weeks. At one point a book was chosen to be read that kept the entire class enthralled. That book was called Captain Cobwebb and the Quogs. Now, I couldn’t tell you exactly who Captain Cobwebb was, because as far as I can remember the heroes of the story were two young boys. I might have completely mis-remembered the plot, but it went something like this. The two boys stumble across an underground realm inhabited by sinister creatures called Quogs. The Quogs were presumably spider like in some way, because I distinctly remember the boys being caught and bundled up in a silky cocoon of some sort. Obviously they escape, and bring about an end to whatever nefarious plan the Quogs had in mind. 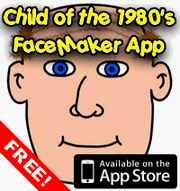 Is it not a fact that stangipostril skiddibumperies of the collywoblic neuroproxis, are metatarsely plod-lodricate.